This video is a digital file served to you from our server that you download using a link sent in your email receipt and/or provided on the thank you page for you to download a MP4 digital video file. This file may be played on any video player installed on your computer or smartphone, and even a smart TV. 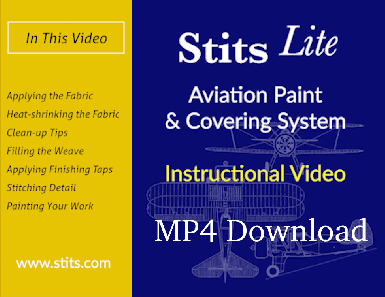 We redited the video with seven chapters, including an introduction to Stits Poly-Fiber covering and paint system by the founder/creator Ray Stits, presented by Captain Chip Mull, and Sam Wright. It teaches about all the products with the techniques for the application of aviation covering system, tips and tricks.